French architects X-TU have designed a building for social housing on rue Marcadet in Paris. The modern structure is clad in a soft gray aluminum skin, with (seemingly) randomly placed boxed extrusions lined in bright green that frame the windows. In addition to the windows that project off the façade, there are smaller ones that lie flat within the aluminum. The result is a contemporary, bright building with coordinating bright green interiors in the mailroom and entrance staircase, as well as in the tiled bathrooms. 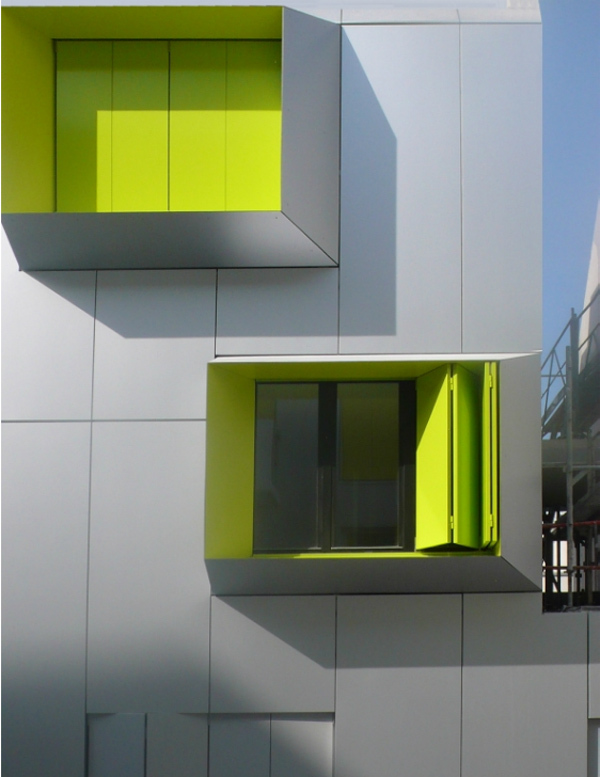 And, of course, the bright green folding shutters, both within the exterior boxes and lying flat against the building’s skin. The building is thermally insulated as per the new regulations and has solar panels placed on the roof, so clearly X-TU architects have taken sustainability into consideration…thus adding even a little more ‘green’ to the project.